We are manufacturer and supplier of a comprehensive range of best quality Coil Straightner, which are encountering wide demand in the global markets. Straightener Machines are well appreciated for their features such as corrosion resistance, abrasion resistance, durability and long service life. 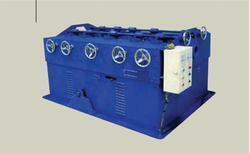 These machines are widely used in industries such as automobile, electrical and electronics for straightening purposes. Bestowed with vast knowledge of the domain, we are able to offer our clients a wide range of Metal Straightening Machine.